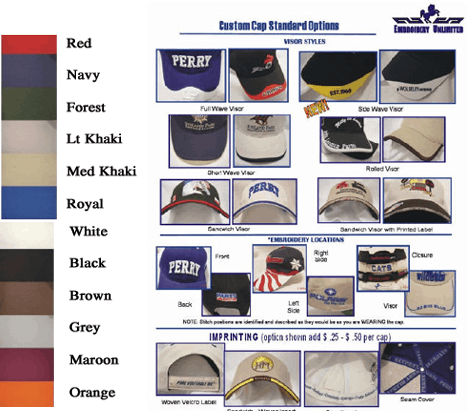 Custom cap embroidery options include all four sides, Velcro tab, and visor, 8,000 stitches included in base price and may be divided into 2 positions at no extra charge. Minimum stitch charge for 3 positions is 9,000 stitches. Minimum stitch charge for 4 positions is 12,000 stitches beyond the original 9,000 stitches and are billed at $0.50 per thousand. Digitizing is billed at $ 10.00 per thousand stitches on CAMERA READY ART. Art submitted not camera ready is charged at $ 15.00 per thousand stitches. If extensive art time is needed to fix the design a price is quoted. Call for special pricing on large orders.